San Diego enjoys a long and storied race car and drag racing history, and the Bean Bandits are a huge part of that heritage. Yet their story remains buried in plain sight. 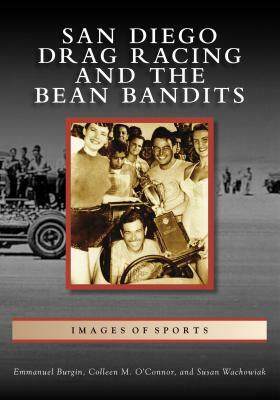 Told here in photographs garnered from private, personal, and historical collections, the 1950s pioneering exploits of Bean Bandits leader Joaquin Arnett and his contributions to that racing history come to life. The San Diego native led his Bean Bandits to over 300 wins and several land speed records while competing against other local clubs, like the Prowlers, Oilers, Roadsters, and Roadrunners. Eventually, the Bean Bandits' streamliners set records on the Bonneville Salt Flats. Arnett won the first National Hot Rod Association (NHRA) Championship in 1953, was named to the International Car Racing Hall of Fame in 1992, and was awarded an NHRA Lifetime Achievement Award in 1994. Arnett and his Bean Bandits' car also graced the cover of Hot Rod magazine's special drag strip issue in 1953. Emmanuel Burgin is an author and former sports editor for El Sol de San Diego. Colleen M. O'Connor is a native San Diegan and retired college professor. Susan Wachowiak is a retired educator and lifelong history enthusiast.